Developer Ironclad doesn't call Diplomacy, the second add-on to its popular PC space strategy title Sins of a Solar Empire, an expansion. It's called, fittingly, a "micro-expansion." Rather than add a host of things that "clip on" to the existing title - new races, etc. - Sins Of A Solar Empire: Diplomacy instead seeks to weave additional focus on diplomacy into the very fabric of a game that until now has mostly been about shooting anything that moves. So, can Diplomacy prove that there's hope yet for world intergalactic peace? Or is war all this game is good for? Let's Talk About This - The original diplomatic options in Sins may as well not have been there. This was a game about conquest, not co-existence. The new tech-tree advances and diplomatic units available in Diplomacy, however, change this. Now it's easier - if you're so inclined - to talk things through, manage relationships in games with multiple adversaries and, most important of all, put those pesky pirates to good use. Heck, there's now even the option to allow a diplomatic victory in the game, with rewards on offer for sending other factions to do your killing for you. Under The Hood - My favourite part of Diplomacy has nothing to do with white doves or handshakes. It's changes to the game's AI, and how finally, in larger matches, Sins can feel like a fair fight. Where previously it felt like every AI opponent would gang up on you from the second the game started, I noticed a lot more inter-AI conflict, which should give you some much-needed breathing space, especially in the game's opening stages. War Is The Answer - All that said, genuine opportunities for the meaningful use of all that diplomacy in the game are few and far between. A multiplayer game where everyone is on the same page, for example, or the use of pirates in a single-player match. Otherwise I fear it'll be treated by most - as I often treated it (as you can see above, I prefer to let my capital ships do all the talking) - as an optional, forgettable extra to a game that was, and still is, built entirely around the concept of military engagement. Ironclad's heart was in the right place here - add a much-needed alternative to bloodshed as a means of conducting intergalactic relations - but Diplomacy falls down in the execution, with the player never given enough reason, or equipment, to want to pursue a diplomatic victory as opposed to a spot of good old-fashioned military conquest. Lucky for Diplomacy, then, the new maps and improved AI it brings to the existing game make up for the diplomatic option's shortfalls, and for serious single-player veterans like me it should prove a big boost to your Sins experience. Better still, Diplomacy comes bundled with the main game and Entrenchment in a new pack called Sins of a Solar Empire: Trinity, which at $40 is a steal if you haven't yet sampled the delights of its take on space warfare. 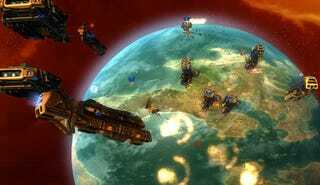 Sins of a Solar Empire: Diplomacy was developed by Ironclad Games, and published by Stardock Entertainment. Released on February 9 for the PC. Retails for $9.99 individually, or for $39.99 as part of Sins of a Solar Empire: Trinity. A copy of the game was given to us by the publisher for reviewing purposes. Completed numerous single-player and multiplayer matches.